Gateway School is an accredited K-8 independent school in Santa Cruz, CA. In 2016, Gateway School wanted to modernize its website by making it responsive and mobile-friendly. 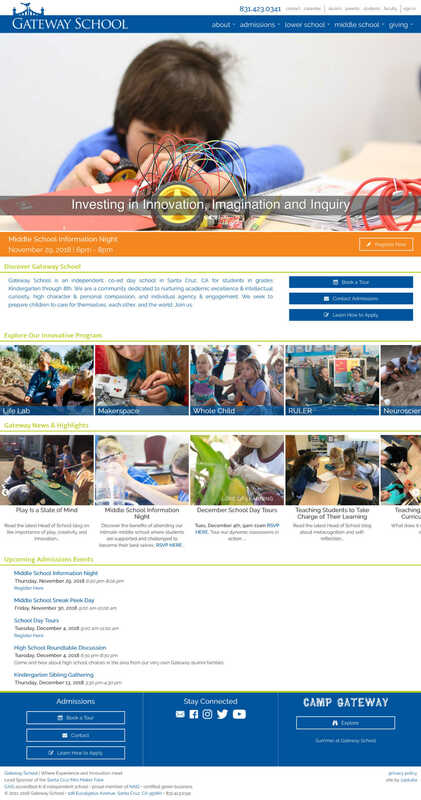 After delivering a completely customized and feature-rich website for Gateway School in 2011 (for details about the 2011 project, click HERE), ZapTuba built a responsive, flexible, modern theme, integrating the post types and features designed specifically to accommodate faculty and staff workflow at Gateway School. Beginning in November 2018, we began updating the website with new content, a subtle style refresh, and adapted the content-rich Admissions and Giving pages to a long-scroll design.